Even if your ex-spouse has not applied for benefits, you may qualify to collect spousal Social Security payments based on his or her earnings record. When looking at divorce and Social Security remember, the end of a marriage does not necessarily mean the end of your right to spousal benefits. 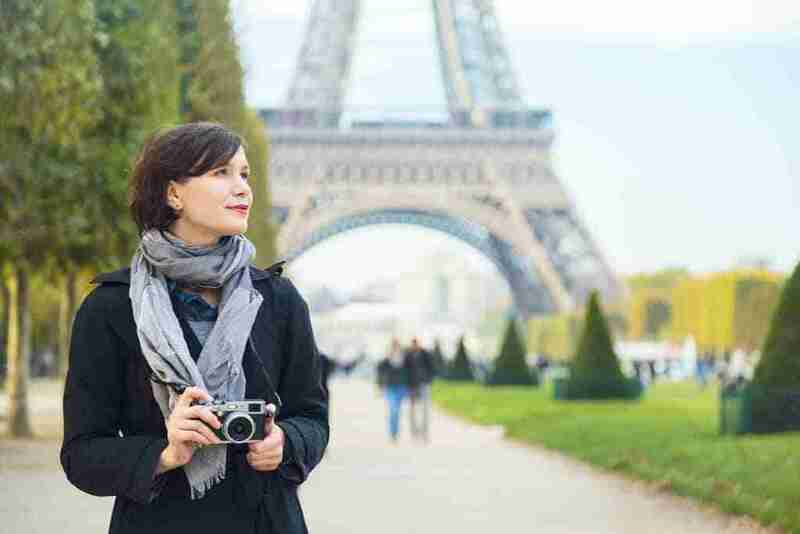 If you were the lower earner, in fact, you’re probably entitled to benefits on your ex’s earnings record. And it won’t cost him or her a penny. 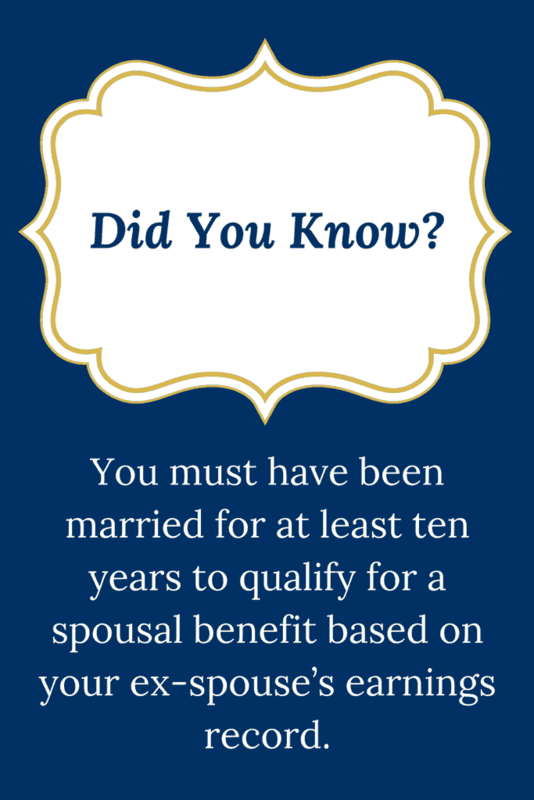 To be eligible for a spousal or survivor benefit on a former spouse’s record, you must have been married for at least ten years and not be entitled to a higher benefit based on your own record. If you’ve been married more than once, for more than ten years to each spouse, you may be able to select the best benefits between your former spouses. To collect based on an ex-spouse’s earnings record, you must be 62 and unmarried. If you remarry, you will lose the spousal benefit, but you can reapply if that second marriage ends in divorce or death. For the most part, the Social Security rules for spousal benefits are the same for divorced applicants as for married couples. For instance, if you claim a spousal benefit at full retirement age, it’s generally 50% of your ex-spouse’s benefit. The benefit will be reduced by a certain percentage for each month you collect before your full retirement age. One difference: You may be allowed to collect spousal benefits even if your ex-spouse has not applied for or has suspended benefits. To qualify, your former spouse must be eligible for benefits, which means he or she must be at least 62, and you must have been divorced for at least two years. A divorced spouse born before 1954 may engage in the “restrict the application” strategy (see page 13) once he or she reaches full retirement age. A divorcee who qualifies might claim a 50% spousal benefit on an ex-husband’s earnings record for four years until age 70, for example, at which time she could switch to her own benefit. Thanks to delayed retirement credits, her benefit would be 32% higher than if she had claimed it at her full retirement age. To collect a survivor benefit on a late ex-husband’s record, you must be at least 60 (or 50 and disabled). As with a surviving spouse, you can continue to collect survivor benefits on your late ex’s record even if you remarry, if you are at least age 60 at the time of the remarriage. If your ex-spouse is deceased, your survivor benefit will be 100% of his or her benefit, assuming you wait until full retirement age to claim the benefit (it will be reduced if you claim it earlier). If you are already receiving a benefit based on your own earnings record, you will continue to receive your benefit plus a supplement to bring the total to the survivor benefit level. And if you were collecting a spousal benefit on your ex-spouse’s record, you can switch to a survivor benefit when your ex-spouse dies. You need to provide the Social Security Administration with a certified copy of your divorce decree to claim any of these benefits. To expedite your application, you should have your ex’s Social Security number, too. Social Security will not notify him or her about your application. Your claim will not affect his or her benefits in any way, nor will it impact the benefits any current spouse or other ex-spouse is receiving on your ex’s earnings record.